Nico Bolzico Has The Funniest IG Captions Ever! Like seriously, Sos, you're one lucky wife! 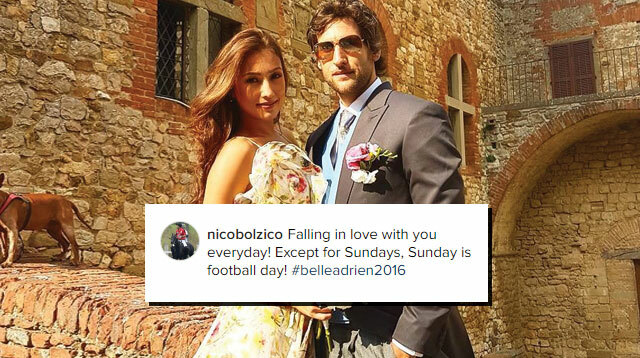 We all know Nico Bolzico as Solenn Heussaff’s other half–yup, he’s super hot, an Argentinian, the founder of the agricultural company LM10 Corp., and is a football enthusiast. But what most people don’t know is that he’s the funniest person ever. We kid you not! If you guys stalk the It Girls’ Snapchat vids or IG Stories, you might’ve seen snippets of Nico’s sharp wit especially when he banters with Solenn. But, Nico really sets the bar high with his funny and witty IG captions that are just the most hilarz ever! "This is my shoot @solennheussaff ... Don't steal my natural light!" "Falling in love with you everyday! Except for Sundays, Sunday is football day!" "We leave the malls of Manila to come to the malls of Florence! When did we let this happen? Girls 1 Boys 0"
"Summary of our trip to Florence! #sosbolzitaly"
"We need to tip this guy 2,000 Euros to bring the luggage of these 2! I was so ashamed I prentended to be their helper..."
"Let me talk please @solennheussaff ! I need to express myself!" "In Siena with my one and only intense wife that I love so much. #forcedcaption"
"In Siena with these people! Nicole in hunting mode almost flashing people!" "Working out time 1 hr, taking the right pic time 2.3 hrs! Always fun w this one!" "Done w shooting for today! Exited for this new project we can't wait to share with you guys! ... Fake! Just a little bromance time! And some needed space from wifezilla @solennheussaff ... JK bebeeeee miss you!" "Teagan being introduced to the pack! Baaaaaaaaaaaaaaaaahhhhhh sowhenyaaaaaaaaaaaaaaaaa mamabeatsebababaaaaaahhh #circleoflife"
"Like I said. Marriage won't change me." "Watching National Geographic Channel! Spot the panther eating a gazelle! It is a dragon fruit though!" "Not the best pic of the day, but the only one where my white pants don't make me look like Ricky Martin!" "First week of marriage and I am already being forced by @solennheussaff to post pictures like this!"